Low profile chairs are popular, because of their portability and their versatility to be used for many different occasions. 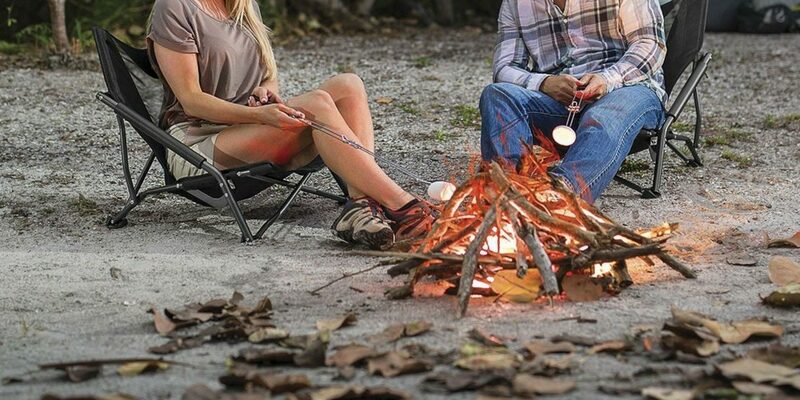 Apart from using them around your campground, low profile camp chairs are perfect for occasions where you want to sit, but don’t want to block the view of people behind you (think: outdoor music concerts and festivals, sporting events, summer movie nights in the park and more). And obviously, they’re great anywhere else you would take a chair as well. If you have kids, a low profile chair can be a good option for them, because it allows them to sit in a “real” chair, that is low enough to the ground that they can easily get in and out of it on their own. Our favorite low profile chair is the Cascade Mountain Tech Outdoor Chair. This chair is affordable, rugged, and comfortable. It sits low to the ground, measuring 21″ high and 20″ wide. It folds up nicely, and can support up to 250 pounds. One of the things that people love most about this chair is how lightweight and easy to transport it is. It packs down to 8″ x 26″, and has a carrying bag with straps. While not exactly suited to backpacking, this is still pretty minimal. A slight drawback is that the Cascade Mountain chair doesn’t have a cup holder or any kind of pouch to hold keys and other pocketables. Kinda hard to see this as being a deal breaker, but it bears mentioning. The Browning Camping Strutter Chair is another all-time favorite (for us and tons of other people). This chair is constructed of a strong, breathable mesh, so you get a lot of air flow. In true Browning form, it’s also lined with Realtree camouflage, giving it a pretty badass look. Sucker is definitely right at home on any hunting trip. With dimensions of 24″ high and 22″ wide, the Strutter is slightly larger sized than the Cascade Mountain Tech chair. It also supports up to 300 pounds, giving it a higher weigh limit as well. If you’re looking for an ultralight chair that you can take backpacking, the Sportneer Portable Lightweight Camping Chair is your Holy Grail. This puppy weighs just 2 pounds, and folds down to a carrying size of 5.25″ x 14.25″, storing easily in your pack. It’s also EXTREMELY low profile, with a seat height at just 13.5 inches. In fact, so low that it’s probably not a great choice if you have difficulty standing up from low positions. Still, despite being extremely lightweight and compact, the Sportneer still supports up to 250 pounds. Aluminum poles and shock-cord construction make it incredibly easy to set up. And, if you’re going to be purchasing 2 camping chairs, the Sportneer Portable Camping Chair comes in a 2-pack (right around $50). How can you not love that?! Perhaps you want a low profile camp chair that still has a slightly higher back. If this is you, the Swimways Kelsyus Mesh Outdoor Backpack Chair is a great option. At 31″ tall, this is a great chair for adults up to 6′ tall and up to 250 pounds. It’s made of mesh, and has a low-slung, slightly-reclined angle, for ultimate comfort. The mesh construction also lends itself to being lighter, and most importantly, better for air flow. These chairs are awesome at the beach, lake, or river, because you can get them wet and they will dry quickly. Get this–the armrests convert into carrying straps. To us this is a little gimmicky, but that has actually become one of the more popular features of this chair.